Post 3 ended with the wisdom formula representing the movement from the Endless One to matter. Also, we have reframed the Divine Plan of making creation in order to know itself to a Divine Trajectory toward re-unification. From the reframing, with the help of Boehme and Teilhard, we can approach this formula, its extension, and the Trinity in a way that may contribute to current interests in bridging the scientific and spiritual camps. The word “dispersed” captures Boehme’s vision of the implosion resulting from “the concentration of desire” — i.e., Endless Unity bringing “itself into somethingness” (HT, p. 97). His progression is: concentration of desire leads to movement (agitation), which leads to anguish from which the tension/friction ignites the fire, which leads to light/love and “now manifesting in the dimension of separability and perceptivity” (p. 110). Anguish “is simultaneously sensibility” (p. 98) or the headwaters of “perceptibility and feelingness” and “a primordial state of self awareness” (p. 109), as arranged by Cynthia Bourgeault in her first three dynamic Trinity diagrams unfolding according to the Law of Three. Interestingly, Boehme sums up the three properties of desire, agitation, and anguish in a first principle of creation that he names “fiery” or “wrathful”. This mirrors the thought in part 2 that the divine quality expected to dominate first would be wrath, as encountered by Job. The Big Bang from impressure is from the internal concentration of psychic forces, not a divine desire creating something to know itself. What implodes outwardly are all the Unity’s diverse characteristics rather than light already in a realm of perceptibility. Unlike Boehme, who slips readily “between physical description and its emotional counterpart” (HT, p. 98), the energy in our reframing on the way to matter is not just light and its emotional association with love but the invisible vibrational stage of densifying psychic forces. From our perspective, perceptibility and the primordial state of awareness entered the picture further along in the process of creation. Nevertheless, Boehme’s intuitive grasp of the proto-stage of movement and primordial implosion initiates the suggested reframing of the dynamic Trinity. From here on, the influence of Teilhard is notable. First off, as a naturalist, rather than a physicist, Teilhard develops his description of pre-life matter (“the stuff of the universe” or its “bits and pieces”; HP, p. 11) by “sound analogy with the rest of science” (HP, p. 24) from the observable structure and properties of life. In the same way, we propose approaching that elusive subtle domain of pre-matter. Support for this approach is the idea held across diverse spiritual traditions that nature is the first revelation of the Divine. The “stuff” of the universe has both an outer face and an inner face, each with its own energy field, which “roughly speaking” finally comes down to being “equivalent respectively to matter and spirit” (p. 230). The outer face operates under the law of complexification. As the “bits and pieces” connect they transform into a more complex structure. Meanwhile, with increasing external complexity, the inside face operates under the law of centricity, an increased interiorization that evolves into higher and higher states of awareness all the way to thought and reflective consciousness. The outer face evolutionary process and the inner face involutionary process operate independently from each other but “they are constantly associated and somehow flow into each other” (p. 30). The “somehow” of the associated physical and psychical energies repeatedly shows up in the reconciling interplay of such factors as biological divergence/psychical convergence, tangential/radial energies, body/soul energies, “unified multitude/unorganized multitude” (p. 28), and mechanization/freedom. The “somehow” is “a kind of homogeneous primordial flux” that is “an active medium of direction and transmission” toward “the less probable direction of higher forms of complexity and centricity” (pp. 14, 13, 32). All the stuff of the universe has aspects of unity within and in relation to the “totality of space” (p. 16). Thus, the random trial and error of chance is a “directed chance” (p. 66). At certain points the evolution/involution interplay leaps creation into a new “state” or “order” of “being” (pp. 231, 237). The net effect is that the universe is moving from a state of the outer face predominating to the inner face predominating as humanity approaches a collective reflexive consciousness at the Omega Point. The applications of these Teilhardian principles to the wisdom formula are perhaps already apparent. The homogeneous flux is comparable to the Divine Trajectory toward reunification. The increasing degrees of densification is analogous to the conjugation of the complexification law and convergence or centralization intensifying process. 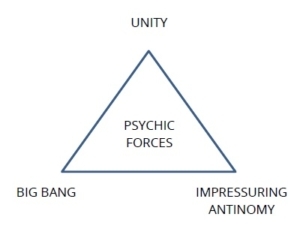 The aspects of unity in the “stuff” of the universe may be regarded as remnants of the Endless Unity essence within each psychic force as it implodes out of the antinomy in totality. The diffusion and outward movement of the psychic forces are within the flux of the “totality of space.” And those leaps into new creations are indicated by the formula’s arrows. 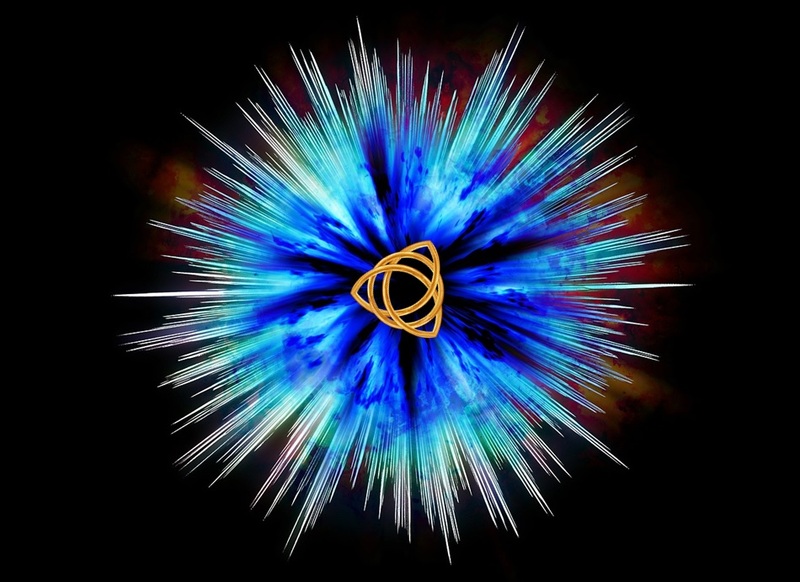 As we adapt the formula to a reframing of the Trinity, the leaps may be likened to that Law of Three alchemical reconciling power bringing about a new arising. 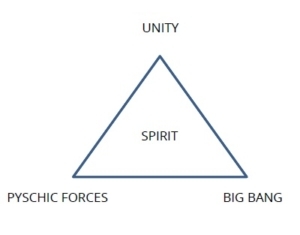 Unity (the Absolute, Divine Source, God, etc.) is totally “other” and transcendent. Its undifferentiated antinomy due to the immeasurable power of its centric state implodes out into separated psychic forces. The Big Bang separating movement relieves the tension and amounts to a creation of space and time. Instantaneously, Teilhard’s “somehow” goes to work. It brings about a space that is a whole in itself — “universal space is the only space there is”; i.e., “we have no choice but to admit that this immensity represents the domain of action common to all [that is in it]” (HP, p. 16). The “somehow” or homogeneous flux, as noted earlier, is the divine trajectory toward re-unification. The psychic forces are moving, thus entailing duration and, therefore, time, within a space of homogeneous flux. Psychic forces are now in the binary/dualistic dimension of space/time. Space, although seemingly infinite from our scientific lens, functions as a container preventing endless outward dispersion. The random yet directional psychic forces diverge and converge and thus condense into spiritual flows. In Teilhardian terms, the outer and inner “faces” (in evolutionary and involutionary fashion) function independently but are “associated” by both being within the flux of space. In the alchemical moment, impressure is transformed into a centrating function and the totality of the antinomy is transformed into a complexification function. Spirit takes the reconciling position as the new field of play of conjugated outward and inward forces. It junctions as a “holding field” or stabilizing environment for alchemizing Unity’s rest and the psychic forces’ movements into a vibrating structure, namely energy. All this may be seen as preparatory to the emerging particle/wave paradox. With the new vibrating expression of the psychic forces, the potential for primitive felt sensation and awareness (perceptivity) is set up. As the pivotal triangle, with three before and after it, it is packed with happenings. Two key ones are the movement of pre-life matter into living matter (inorganic to organic) and the rise of thought from rudimentary communication to Darwinian instinctual communication, and then to self-reflective consciousness. Not delving into pre-matter matters, Teilhard summarily describes a “phase of granulation which abruptly gives birth to the constituents of the atom, and perhaps the atom itself” (HP, p. 18). We can only speculate here by extending Teilhard’s principles into pre-matter times that the universal complexification and centric forces are involved. At any rate, the granulation process now provides substantiality. In short, the new arising finally is matter existing in a dualistic dimension. Moreover, with this new creation comes the element necessary for perceptivity and communication, for exchanging information. For Teilhard pre-life matter is in a pre-conscious state yet primed with the universal “powers of synthesis” (HP, p. 34), the conjugation of complexification and centricity. In the unique case of earth, the outer faces of elements follow the process of “ultracondensing and intercombining” all according to the first two paradoxical thermodynamic laws of the conservation of energy and entropy (p. 20). Meanwhile, the inside face becomes more and more interiorized until it is no longer just lining the outer face but a psychic center: “What was still only a centered surface became a center” (p. 113). In our reframing language, along with all the other psychic forces, the split antinomy of unconsciousness and consciousness is now subsumed in energy (HT, p. 126). In this reconciling position, it gets pricked — Yahweh meets Job face to face. How does this pricking happen? And where have Sophia (Wisdom), Logos, and evil been during all this creating? Answer: the Biblical and Wisdom traditions have assured us that Sophia and Logos have been functioning behind the scenes ever since the Big Bang. With visible matter, they can be observed as they come increasingly to the fore. Logos and Sophia are present hand-in-hand as the ordering and directing principles, respectively — the universal synthesis on a re-unification trajectory. In energy’s vibrating field, Logos (encapsulated in words) is sound carrying Wisdom’s messages. The suggestion here is that evil provides the situation (as held by Jung and others). Logos is the means, as each microcosmic kenotic surrender of the second force opens it to a new way of being. And Sophia is the catalyst for the way of re-unification in each leap to a new arising. The leaps are characterized as being abrupt and out of nowhere, which is how we experience hits of wisdom — those “aha” moments of suddenness and “surprise, satisfaction, elegance” (HT, p. 43). One other key happening needs recognition. 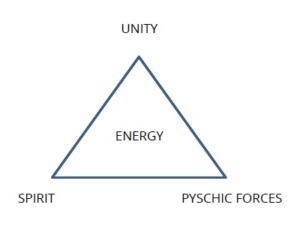 Through the first three triangles, the transformation of psychic forces as emanations of the Unity has been predominant. Yet, within these emanations (the stuff of the universe) is a remnant of Unity’s essence as aspects of unity in each element as well as in space as a whole as a universal flux as discussed earlier. With the appearance of matter in the fourth Trinity formation, immanence overtakes emanation as the operating system. Yahweh must be his creation (see post 3). 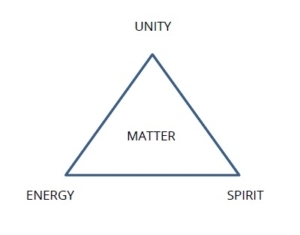 Because we are regarding the Trinity being modeled here as a Christian icon, the dramatically evolved matter in the fourth triangle is represented now as Jesus, a life form of matter with a highly evolved consciousness operating out of non-dual perception. Recalling that consciousness is communication which, when undertaken as an intentional give and take for the good of the whole, we can equate Jesus’ consciousness with love. He is in the position to reconcile the transcendent, at rest in Unity with the split psychic forces manifesting in matter and energy. The outcome of his five roles is the pervasive presence of the Holy Spirit. Immediately apparent here is the addition of the two-way flow of the arrows. This indicates the now direct communication with the divine provided by the Paraclete. Thus, the shift from a covenant to a consciousness relationship is established. A second crucial addition is humans are now in place of Jesus as representing the highest evolved organic matter. When humans operate out of a non-dual perception open to the Holy Spirit a new arising occurs. The Holy Spirit mediates between the self-reflective consciousness of corporeality and the non-conscious no-thingness Unity. As a result, for every evil (life-denying, divisive, tense, closed off, etc.) situation in this dualistic world the Christosophanic means and way carried in the Holy Spirit transforms the separated materialized psychic forces. The new arising is re-unification of the Divine’s qualities — the living expression of Unity in a space/time dimension. 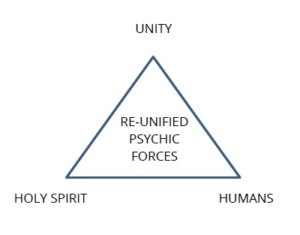 Under the assumption that humans as a whole put on the mind of Christ, sixth triangle new arising of re-unified psychic forces moves into the reconciling position as the One New Humanity. 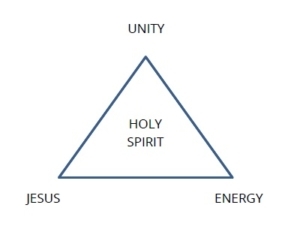 The push-pull tension between Unity’s absolute unity and the Holy Spirit’s re-unifying promise can only continue to be reconciled through the medium of One New Humanity, the body of Christ. 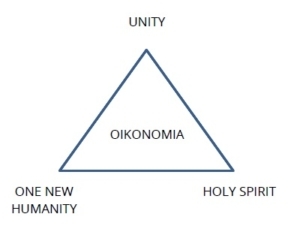 This is Oikonomia: the realization of the Unity’s essence in diversity, the consummation of the Divine Trajectory. In Teilhard’s words “cosmogenesis has become Christogenesis” (HT, p. 80; HP, p. 213) The spiritualization of matter is complete, including perhaps a transfiguration of the physical body, which is a subject for a separate discussion. This overly succinct reframed journey through the dynamic Trinity stages has avoided Boehme’s associative leaps and employed Teilhard’s synthesis. It is offered to stimulate thought about ways to bridge science and spirituality. 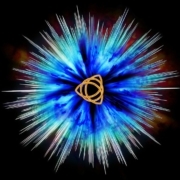 It also demonstrates once more not only the versatility of applying the Law of Three to the Trinity, but also how it all finally comes down to us, the microcosmic pinnacle on earth. Let’s pray that the macrocosmic journey through billions of years has not been for (to borrow a word from Satan) “naught” (Job 1:9). Peggy Zimmerman has been as a technical editor, environmental and urban planner, university instructor, mental health counsellor, and human resources manager. Since retiring sixteen years ago, she has participated in environmental activist work. In that time she also rediscovered her Christian roots and set out on deepening her spiritual life, largely through a personal study of the Christian wisdom tradition. She arranged for the introduction of Centering Prayer to the Comox Valley, facilitates a weekly sit at her church, initiated and continues to facilitate a monthly Taizé service. Bourgeault, Cynthia. (WJ) The Wisdom Jesus: Transforming Heart and Mind — A New Perspective on Christ and His Message. Boston, MA: Shambhala Publications, Inc., 2008. Teilhard de Chardin, Pierre. (HP) The Human Phenomenon. Sarah Appleton-Weber, trans. Chicago, IL: Sussex Academic Press, 1999, 2003, 2015. I have appreciated the content of this series very much. However, I need to say that the use of masculine language for the Divine made it difficult to read. Having used inclusive language for so long, I find the use of the male pronouns off-putting and distracting. In my opinion, the nature of your work cries out for a more inclusive treatment.